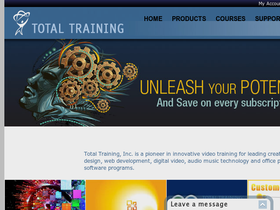 Total Training, online at totaltraining.com, is the place for software training for creative minds. Total Training offers a variety of different training programs to allow you to find your fit. Among those offered are Adobe Training, Microsoft Training, Business Training, Audio/Music Tech, and more. Total Training is sure to offer the most popular brands including Apple, Microsoft, Adobe, Inspitech, Autodesk, Corel Corporation, and Intuit. So start your training with Total Training and remember to stop by RetailSteal for the best Total Training coupon codes, Total Training promotions, and Total Training discounts. Shipping and handling rates vary depending on the total purchase from Total Training. See website for full details, exclusions may apply. Enter our coupon code at checkout at Total Training to receive a 25% discount on your purchase. Use our promotional code at Total Training and save 50% on training DVDs for Adobe, Apple, Microsoft and more. Click here to save. Use this coupon code on Total Training premium software and save 25% off your purchase. Enjoy 2 years of training for the price of 1 - for a limited time at Total Training Software. Click link to save and use coupon code. Act now and take advantage of a 50% discount on all Adobe CS5 DVD training bundles with this promo code from Total Training. Click here to shop. Total Training is offering 20% savings on your purchase when you enter this coupon code at checkout. Check out the warehouse clearance sale at Total Training and save up to 75% off DVDs and Bundles. Learn Microsoft Office for as low as $24.95 a month at Total Training Software. Click link to buy now. Visit 360 Training and take a federal individual income tax course for only $820.00.